Leslie’s novellas were captivating and held a level of depth that was unexpected and conveyed well in the pages allotted; this was a good read and something I would recommend. The incredibly beauty of Leslie’s writing is that it can be so mundane, and yet also so full of meaning for his characters... Leslie’s adept development of character shows us that Three Men could be anyone, because everyone has a story. There is a sense that Leslie could make a story from any person or even any moment, since each moment is full of living, full of seeing and feeling and struggling to make sense of things. "Madre is a potent meditation on the implications of motherhood, from which the reader draws insight and entertainment in equal measures." "In his debut collection of short fiction, Nathan Leslie delivers a dark and scathing portrait of contemporary American society...Rants and Raves offers nothing less than a portrait of hell, a picture of an America about to implode." "Leslie captures us in this Being John Malkovich style possession of another's life with the informal, almost rambling style of the character's thoughts. The stream of consciousness method lends a feel of genuine, talking to a buddy communication, rather than the neatly trimmed, formal dialogue of standard fiction. Now you're probably thinking; so why would I keep reading? I can go down to the coffee shop, or call my mother if I want to hear someone real ramble on about their life. The answer is imagery, and brilliant writing." "Fans of classic cars may enjoy these stories for their authentic feel—fans of the short story for the characters, some of them memorable. Either way, Drivers makes a mark with it's simple, relevant themes and the whisper, faintly heard, of the lonely American highway, folding in on itself the million dreams of all the drivers with their hands tightly gripping the wheel." 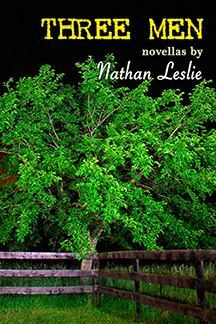 "Through trials and triumphs, Nathan Leslie’s fleshed out characters are compelling and realistic. Leslie explores the relationship that is often put on the back burner in American literature: brothers and sisters help each other find their own place in life. From haunting to compassionate, Sibs gives the reader a glimpse at the life of brothers and sisters in his or her own community and around the world." "Leslie’s bold caricature and sharp satire are, above all, Rabelaisian—humor that is exaggerated, bizarre, and way, way larger than life... but the added deadpan and delayed reaction timing in the homespun comedy of Twain, Keaton, and Chaplin also come to mind." "With 58 stories tightly packed in this slim volume all you need do is turn a page to enter another of his compact little worlds. If you like the MICRO and FLASH forms it's certain you'll discover a number that amuse, provoke, or startle."